Belize is located on the Eastern coast of Central America and was formerly known as British Honduras. It has a parliamentary government and a population that speaks English, Spanish, and Creole. 5 May 1980 – Missionary work began in Belize when President Samuel Flores of the Honduras Tegucigalpa Mission and missionary Robert Henke arrived. Ten additional missionaries arrived the next day. The Belize City Branch was organized with missionary Merlin Mikkelson as president. 11 May 1980 – The first meeting was held. 1 June 1980 – Ernesto Alay was baptized as the first member in Belize. Belize received independence from Great Britain. 17 April 1983 – The Belize District was organized with Harold Smith as president. By 1987 the church membership in the Belize District numbered approximately 1,000. Hilberto Cassanova was the first missionary called from Belize. He served in the Honduras Tegucigalpa Mission from 1987 to 1989. August 1987 – A meetinghouse was completed in Orange Walk. 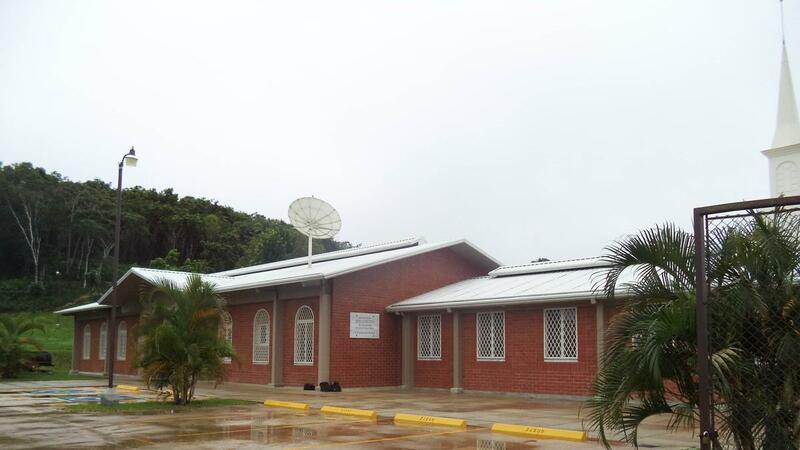 September 1987 – A meetinghouse was completed in San Ignacio. 1 July 1990 – The Honduras Tegucigalpa Mission was divided and Belize was placed in the new Honduras San Pedro Sula Mission. 18 June 1991 – Cayo Belize District organized. 7 December 1992 – Belize was dedicated for the preaching of the gospel by Elder Russell M. Nelson. The ceremony took place in the suburb of Burrell Boon, nineteen miles west of Belize City. About thirty-six members gathered in a secluded, grassy garden on a farm. These members included the district and branch leaders. Rain fell before and after the service, but only a light sprinkle fell as Elder Nelson offered the prayer. 13 November 1997 – President Gordon B. Hinckley became the first Church President to visit Belize, speaking to approximately 1,200 members gathered in St. John´s College Gymnasium in Belize City. It was the largest gathering of members in the country to date. They had arrived in buses from all over the country. A small group even traveled by boat. Historical information was taken from the 2012 Church Almanac and the Church News. For more information on the Church in English, please see www.lds.org.